Are you a music lover? 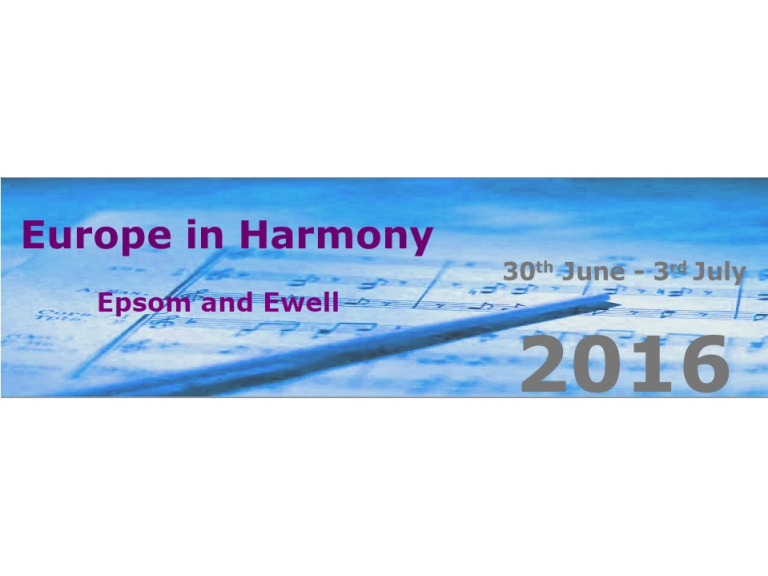 Well the Epsom and Ewell Town Twinning Association would like to invite you to book your tickets for the Choral Festival before they are all sold out! All tickets are free but seats for some concerts need to be reserved. Choirs come from France, Belgium and Germany as well as from the Epsom and Ewell area will be singing a varied programme to suit all tastes. Saturday 2nd July there will be a formal welcome, followed by opportunities for music making at a variety of venues and, in the evening, a Festival concert. This will include short programmes from visiting choirs followed by the performance of classical English works by a combined festival chorus at Epsom College. Then a post concert refreshment with visitors, VIP guests and representatives of local choirs. The evening event starts at 7.30pm. Tickets are free but must be reserved online at epsomtwinning.com/festival/reserve.html. The people of Epsom and Ewell are proud to be hosting this prestigious event. You are very welcome to come along to the events and demonstrate your support for both our local choirs and those of our international friends.